Hello, fellow film buffs. We have been quiet for a little while, but with the #CriterionBlogathon just under a month away, we are about to roar! Most importantly, we are imposing a deadline for topic choice submissions as of this Friday, October 23, 2015. We have updated the Blogathon roster here, and are currently at 170 topics. If you want to participate, this is the last call for you to secure a topic. After checking the roster, please complete this form to participate. You may also be interested in the podcast that we recently recorded with Kristina over this past weekend. We discussed not only the blogosphere, blogathons, and online film community, but also this specific blogathon. Hopefully you will find it to be an interesting discussion. We certainly enjoyed it! Kristina blogged about her experience here. 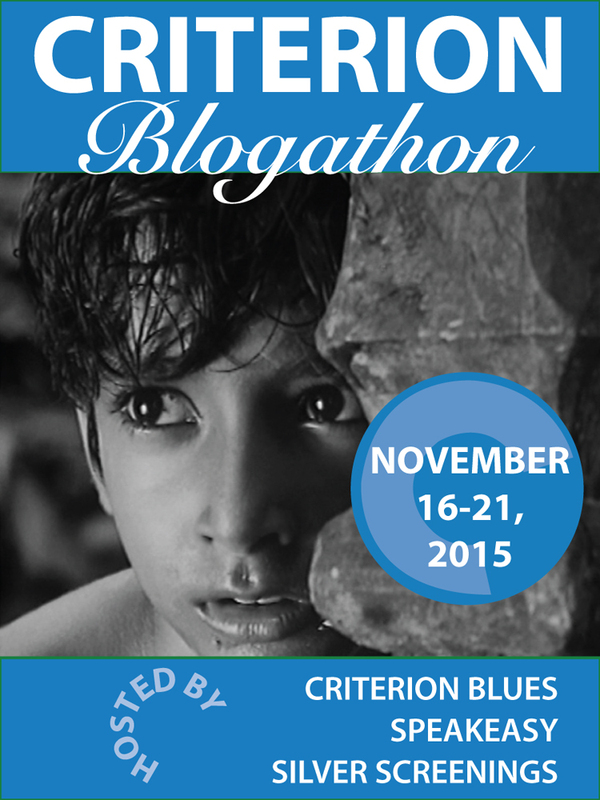 The Blogathon will take place over six-days, from Monday, November 16th until Saturday, November 21st. We have divided the topics into sixths, which was not an easy task when you have films from all over the globe that span roughly a hundred years. We divided them by region of the world and time period. Kristina, Ruth, and I will each be hosting two days worth of posts. The complete schedule is going to be unveiled next week! It will be revealed one day at a time. I hope you follow all three blogs, but if for whatever reason you do not, we will re-blog each post. You can treat these days as “deadlines.” It is not a strict deadline and we will still edit your contribution into the ‘thon if it is late, but there are some incentives for being on time or even early. Incentives? Does this mean recognition? Does this mean things? Once the event is completed, we will give out a Best in Show prize for each category, which will be a yet-to-be-announced actual thing. That is, an actual thing that someone would want! Yes, something that would actually cost money! Out of the large number of entries, this will be a tough choice and we hope everyone will be a good sport about it. We also hope everyone will give it their all. To recap: Deadline, Podcast, Schedule, Awards, Grand Prizes! Keep your eyes peeled towards any of the three hosting blogs next week. Posted on October 20, 2015, in Blogathon, Criterions. Bookmark the permalink. 15 Comments. Yay! We’re only weeks away from the Criterion Blogathon! Less than a month away from participating in my first Criterion Blogathon. I have been preparing for 2 films one a French Noir murder mystery and the other an Asian film about baseball which will be just in time after the crowning of the 2015 World Series champs! Just making sure I’m understanding (or not understanding) this right: the deadline for getting a completed review submitted to you for your Criterion blogathon is this Friday? You are the second person to come away with this misunderstanding. No, the deadline to choose a topic is this Friday. The actual article is due next month. We will announce the exact schedule by day next week. I’ll edit the post to make it more clear. Okay, cool…I was suddenly in a panic, thinking I had to write a review in two days time! Thanks for clarifying! Reblogged this on Movie Musings and Podcastings. Y’know, I would love to participate in this. my current work life leaves essentially no time to write anything, but I am willing to do it you you, Mr. West…..
I’ll get back to you in a day or so,OK? ok, I’m gonna commit myself. I would like to do a commentary on L’Avventura, and specifically on its commentary track. Filmscreed is the site. Hey Jeff, that’s great .. and creative. I love the commentary track. You have a month so don’t fret if it seems like too much. Can I trouble you to submit a Google form? Keep your eyes peeled for this Criterion Blogathon in November; yours truly will be participating by posting a review of Roman Polanski’s “Macbeth” (1971)! Pingback: Random Film of the Week: High and Low | "DESTROY ALL FANBOYS!"